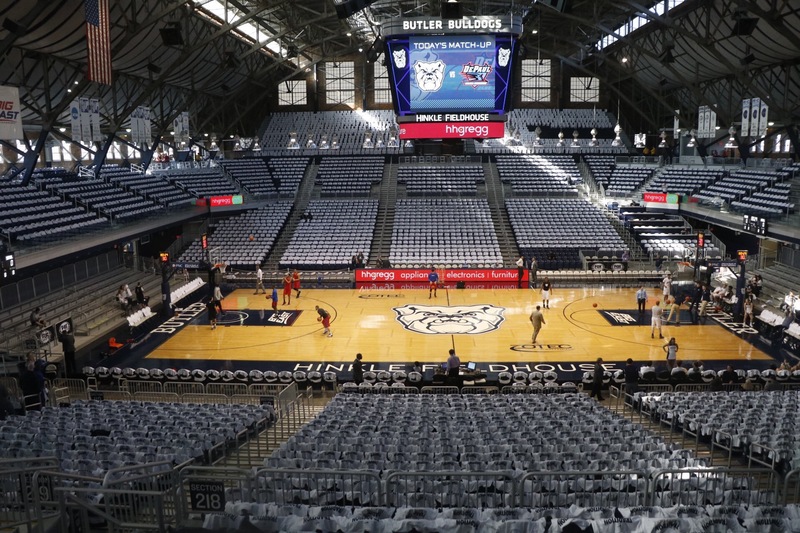 T-shirts line the seats of Hinkle Fieldhouse before a men’s basketball game. A public hearing regarding alcohol sales will be held on Sept. 18. Collegian file photo. Last week, Butler University released a public notice that it has applied for an alcohol permit for Hinkle Fieldhouse with the hopes of selling alcohol at select sporting events starting this basketball season. Butler hopes to join a list of other schools that are starting to sell alcohol at sporting events. Recently, Purdue University announced it will sell alcohol at sporting events this year. Also, the possible move would leave St. John’s University as the only remaining Big East Conference school that does not sell alcohol at sporting events. A permit was posted on Hinkle’s doors on Sept. 7 as a notice for a public hearing where fans can weigh in on if Hinkle should sell alcohol, as well as what regulations would surround the alcohol sales. Regulations could include how many events, what specific events and if a time limit will be imposed on the sales. Then, a committee will make a recommendation to a city-county entity, and then it will go to the state for approval. Not everyone has been supportive of this decision. On social media, the feel is mixed. Some fans love the idea, while some fans hate it. Melissa Iannuzzi, who graduated Butler with a strategic communication degree in December 2015, initially voiced her support for the alcohol permit on Facebook. Iannuzzi, who purchased season tickets this season for the first time, said she thinks this is a smart move on Butler’s part. On the other side is a section of Bulldog fans who feel that Hinkle is not the place for alcohol. One person representing that argument is Jeff Leffew, a long-time Butler fan who has purchased season tickets for seven years and made numerous contributions to the Bulldog Club. Once the news broke last week, Leffew said he was done with attending Butler basketball games. He cancelled his season tickets, asked for a reimbursement of his Bulldog Club contribution and emailed Collier. Leffew said his fear is that Hinkle Fieldhouse will lose the family environment that he said he has grown to love. The public hearing for the decision will be held in downtown Indianapolis on Sept. 18 at the City-County Council Building in Room 260 at 9:30 a.m.
Iannuzzi, who said she doesn’t plan on attending the public meeting, said she doesn’t think alcohol sales during basketball games will change the environment or atmosphere at Hinkle. Leffew said Collier replied to his email and the two will be meeting soon so Leffew can voice his displeasures. Leffew also said that if Butler is granted an alcohol permit for Hinkle Fieldhouse, he promises never to return. Don’t claim to be a Butler fan if you’re Twitter avatar shows you wearing a Notre Dame hat.